Following on from two discs of Australian art song, Stone Records is delighted to present this wonderful double CD of Australian music for flute and piano. The composers may be familiar to aficionados of Australian classical music, but will be unknown to the greater listening public � their music shows its European and Asian influences, as well as exhibiting the unique voice of Australian classical music. 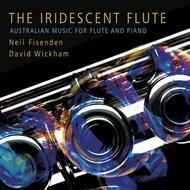 Australian flute virtuoso Neil Fisenden performs the works, together with David Wickham, the wonderful pianist on the Australian art song discs, who also wrote the extensive, informative booklet notes, giving an important insight into these fantastic pieces. This is beautiful, original music that will be a revelation and a delight to all lovers of classical music.